As far as I know Oasis has been closed for some time now. The owner Fish passed away and the place has been sitting. It’s such a loss of a great man and an amazing venue. If you ever met the owner Fish, you would be extremely sad right now. 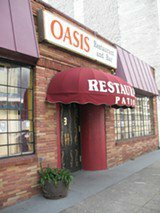 The Oasis Restaurant and Bar is a great place with a very very relaxed environment. I recommend going here at night. They have a small inside bar and if you go around a large outdoor patio with seating, couches, heat lamps and all. I would call it swanky and full of swag at the same time. It’s almost always warm because the buildings block the wind and they have the heat lamps. As for nights to go it can be hit or miss. You almost have to know when an event is happening here. As for now they do have Rocksteady Wednesdays which is reggae and like beats. Friday Open Patio, same idea. Also on some Thursdays they do a poetry slam and sometimes a comedy slam. I must say these are fun events. However it is also a restaurant with a full menu that serves food in the day. Unfortunately they have no website with full info so you’ll just have to go check it out.